I love the combo of these two colors! It's autumn chic and Christmas-esque as well! Great statement necklace as well! You look beautiful! 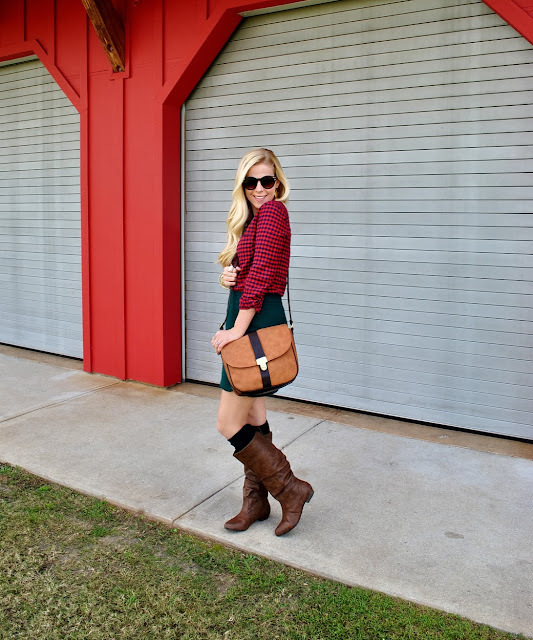 Super cute outfit for fall! I love your pretty gold bangles. Obsessed with this outfit. The skirt is to die. really adore this whole outfit. Very holiday chic. awesome necklace! You look beautiful! I love the whole look, except the boots..
Love the boots and bag. Target is the best. Gorgeous color combo. Looks like holiday. The colors are so festive, love! I like the mix of checkered shirt and green skirt! Great bracelets! Great look for the holiday season! Love the bracelets. I love the look. The statement necklace is so gorgeous! This is a fab look girl! Love the necklace and the knee highs poking out the top of your boots! That is super chic right now! This outfit is perfect for the holidays, you look so festive!! Love this outfit!! NOTHING about this outfit I do not LOVE! You look amazing! Love your fall look today and these colors work so great together. Love this festive outfit! I'm obsessed with that skirt- I may just have to snag it for myself! Cute! Christmas-ey without screaming it. Gorgeous combination. You look lovely! I love that tartan blouse with the great boots! So perfect for the holiday season! I just LOVE this whole outfit! Super cute for the holiday season! Love this check shirt and skirt Anna!! Such a great combo especially for the holidays! Thanks for stopping by! I've been eyeing this shirt from J.Crew for a bit and I need to just get it already! You look beautiful as always! Love it!! I wanted to wear a red plaid shirt today actually! Love this version!! Thanks for stopping by my blog and commenting! You are amazing as usual! 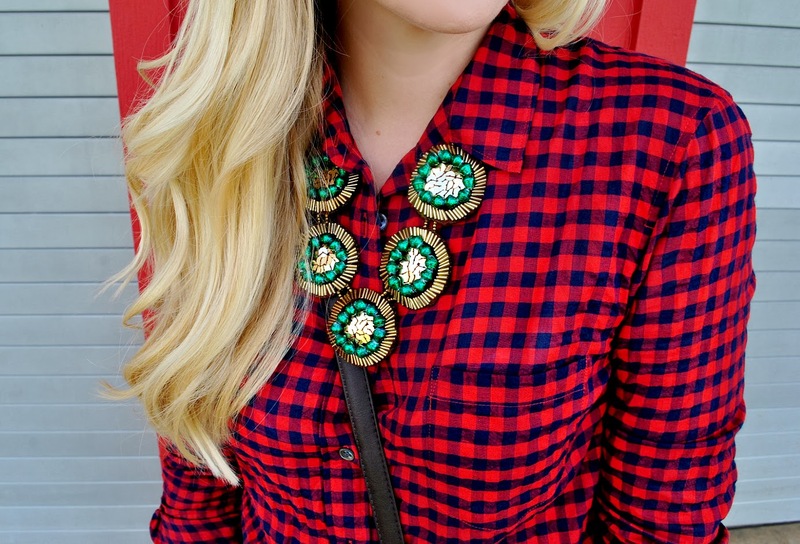 That skirt is so chic, love how it contrasts the fun plaid shirt, and what to say about that fabulous necklace? love it! I normally never pair red and green together in fear of it looking too Christmasy but I absolutely love this look on you, so you proved me wrong girlfriend! I love how this doesn't scream "Christmas colors". I'm always afraid to pair red & green together because I feel like a Christmas tree, I need to mimic your styling ways! Wow seriously you have the best wardrobe. The outfit is simply stunning! I especially love the statement necklace, the colors are gorgeous! Fantastic outfit, love the statement necklace! adorable outfit! loving the red and green together! I like the look, the socks are so cool the outfit. In love of the necklace! I love that this is a holiday look without being too holiday. If that makes sense. hehe. This necklace is beautiful - it complements that outfit beautifully and I love the arm candy! Hello hotsuff! Wow.. you look gorgeous. I love that top on you, so pretty and styled perfectly! boots from Target yay! you styled it so well i love it! love all the pattern and texture pairing here! its absolutely gorgeous! Love this combination...I would never think to put these colours together, but they look fab! Totally loving the red and green together. You look gorgeous as always! Love the bracelets & the shirt !! I love your entire outfit .. I love the accessories the most! 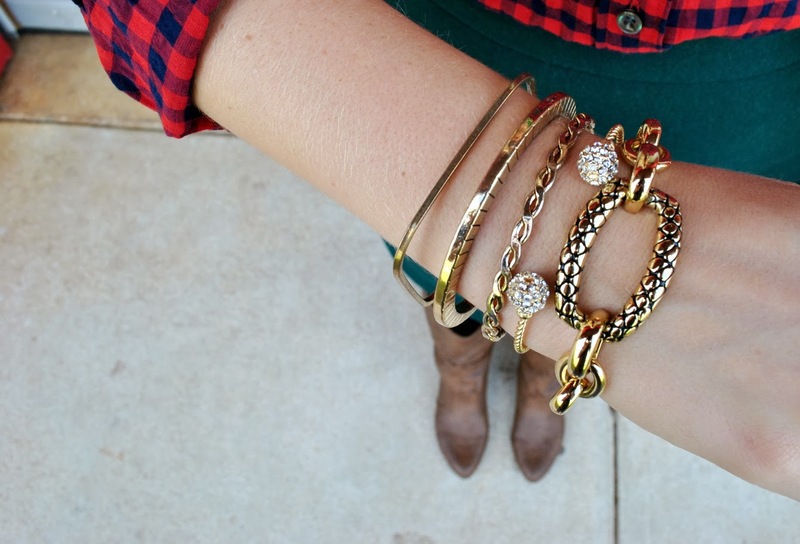 golden bracelets are great! 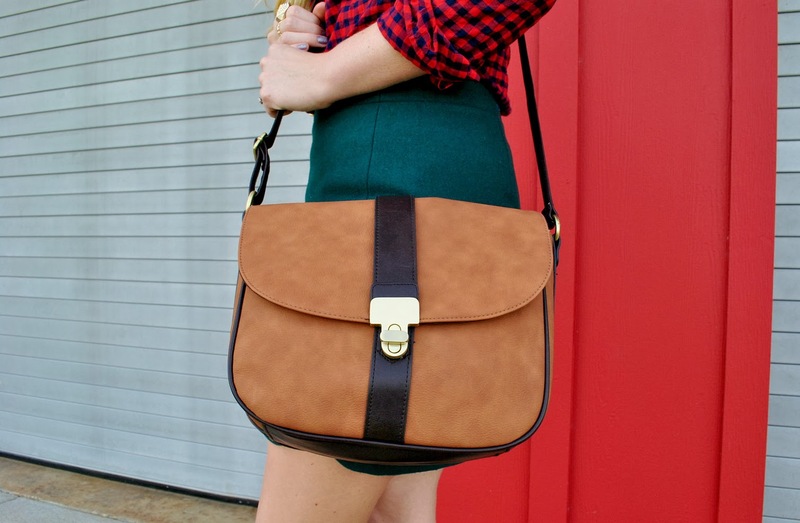 That crossbody looks like butta'! :) I love how camel goes with everything! This look is perfect for the holiday season! Love the color of your skirt! Gorgeous look! Your style is so lovely!! What a perfectly festive color combo! I love the cut of that skirt! Looks great with the plaid...someone is getting ready for the holidays! The top is so cool and edgy!